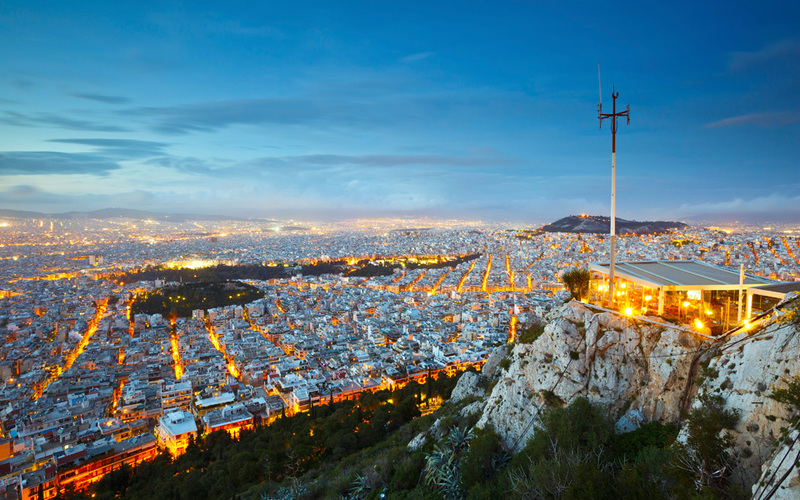 If you want to clear your head, ride the cable car up Lycabettus hill! Athens from above is even better than at street-level. As long as the Acropolis remains in place and the Earth continues to turn, the airy refuge atop Lycabettus will always be just a short stroll from the city center. Let’s say you’re sipping coffee in Kolonaki, one of the capital’s busiest, most cosmopolitan neighborhoods. Imagine, in just 10 minutes you could be sitting on a bench, on a lush green hillside covered with pine, olive and almond trees, or taking in the Athens cityscape through a telescope. Lycabettus offers a refreshing breath of nature even the locals regularly seek out. 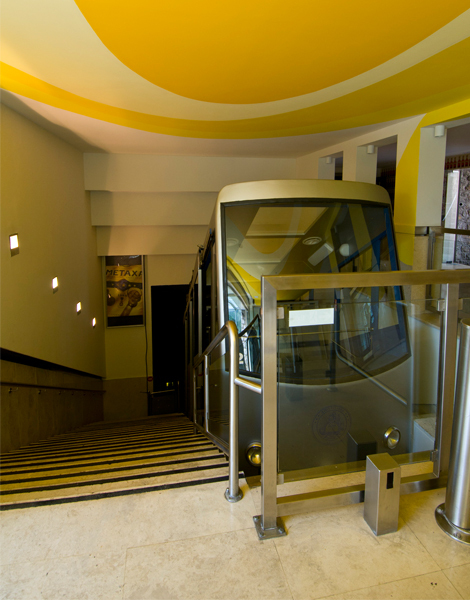 On foot, by car or with the funicular, you can soon be at the top of the highest hill in Athens (270 m.), enjoying a view of the entire surrounding basin, marveling at the surprisingly diverse avifauna – with goldfinches, collared doves, blackbirds, owls and other birds vying for your attention. 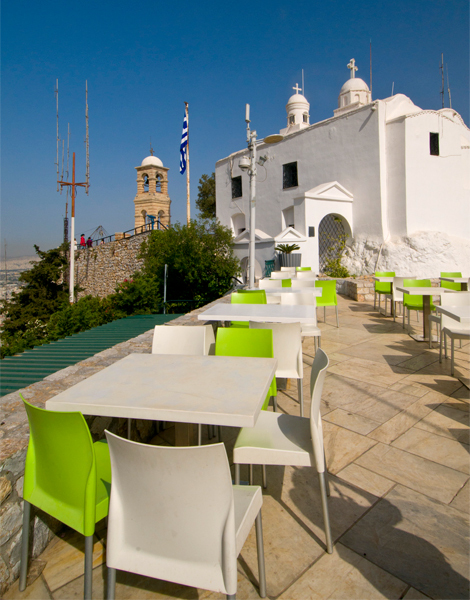 At the top, you will find the cafe-bar-restaurant Orizontes, with a Mediterranean menu, and the tiny Chapel of St. George, built in Cycladic architectural style and first used for worship in 1834 (open daily 8 a.m. – 2 p.m. & 4-9 p.m.). The Sunday service (which starts at 7.40 a.m.) is a memorable experience. The square outside the theater, where young Athenians park and drink beer from the canteen, stays open till 2 a.m. Also, be sure to visit the Church of Agioi Isidoroi, “carved” out of the largest cave on Lycabettus in the 15th or 16th century (open daily 9 a.m. – 12.30 noon). (or every 10 minutes at peak times), and the service runs from early in the morning till 2 a.m. the following day. Return ticket: €7 per person.